If you're an athlete or simply love the game, here are some reasons why playing basketball can keep you in shape this summer! Keep your heart healthy by building endurance while printing up and down the court. Enhance hand-eye coordination while practicing some free-throw shooting. By installing a half court from Sport Court at your home, you can routinely warm-up shooting free-throws. 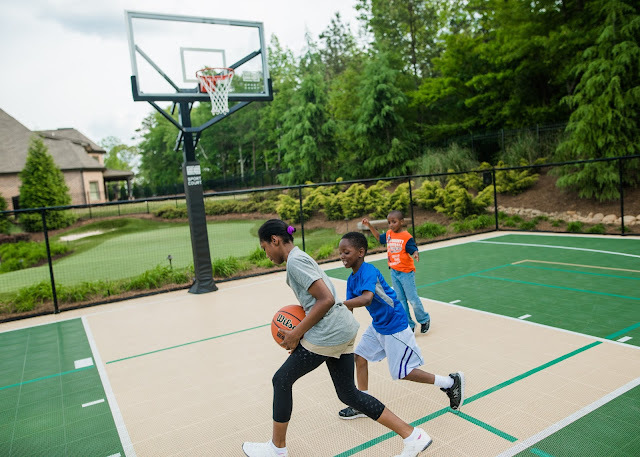 Sport Court designs custom half courts and full courts, so you can create your own dream court. Depending on your weight, health, and the amount of time you spend on the court, stay fit by burning up to 750 calories from playing an hour long. Basketball improves your balance, where you can develop footwork similar to Kobe Bryant. Sport Court basketball court surfaces such as PowerGame, provides a foundation where you can pivot to a fast break. Reduced stress, and a boosted immune system are more health advantages that come from playing basketball. While playing a two-hour long match there are no worries about any joint damage, because of Sport Court's patented Lateral Forgiveness technology. It has been specifically engineered for PowerGame causing less strain on your joints and fatigue for longer playing time. Start a healthier lifestyle today, by having a Sport Court basketball half court or full court installed today. For a free estimate call (800) 296-5566.